"Insul -Wye" adapts to any existing B-Vent chimney. The Insul-vent lateral "wye", is a new component that makes installation easier than ever. 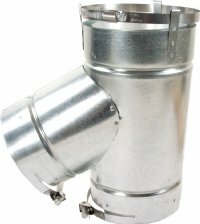 The Insul Wye adapts to B-Vent with branch connections and is insul-vent flex ready.